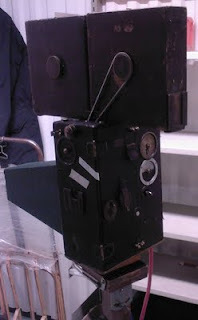 I'm currently working at the Swedish Film Institute's archives in Rotebro, just outside of Stockholm. Today I browsed through Bergman's personal film collection, which he had in his home at Fårö. A lot of Chaplin and Keaton films, various Fellini films and many other things. A good selection, although not particularly surprising. But among the films are also a lot of animated short films by the Swedish cartoonist Victor Bergdahl, from 1915 and 1916. Bergman was a fan. Here's a film by Victor Bergdahl. It has some rather crude stereotypical portraits of black Africans in the end. It's a symbol of its old age, although it's got a sweet ending, with the Swedish sailor and the African princess kissing romantically at sunset. Are films so often so predictable for the same reason that children want to hear the same bedtime story over and over again? Because it's safe and stable and you can watch without having to be nervous? But regardless of the reasons, what would happen if films started to be unpredictable? I don't mean in the "oh, we're so clever, we have a twist in the end which you never could guess"-way, which is, in its way, just as predictable because if you know you're in for a surprise, nothing that happens really actually surprises you. (Or shouldn't at least.) No, what I mean is real unpredictability. Take the new film with the lovely Katherine Heigl, The Ugly Truth (2009). I haven't seen it yet, just the trailer, but I believe I've got the gist of it. A woman (Heigl) is interested in Man A. She has a colleague (Man B) whom she finds disgusting. But she agrees to let him help her get Man A. Now, I'm guessing that Man A will be repelled by the forceful style of her dating manoeuvres, and that she instead will fall in love with Man B, a love which he will reciprocate. I could be very wrong, and I hope I am, because it would be so very interesting and brave should the film take a different turn. Let's say that Man A is promoted and moves to another city, and she ends up alone, having a fling with the janitor. And she and Man B remain only friends, and barely that, because, after all, he's pretty disgusting. Now, how would the intended audience react? Would they be upset? Feel let down? Disappointed perhaps? Would it damage the film's box office figures? Now that's the real unpredictability here. When I've seen it I'll tell you whether I was right or wrong. No, I will not now make my own list of my 20 favourite films since 1992, I just want to defend Anything Else (2003). Quentin Tarantino put it on his list of the 20 best films since 1992 (the year he became a director) and in the blogosphere people have been flabbergasted by this. But why is it only Tarantino, me and my dear cousin Sofia who has noticed that it's one of Woody Allen's best films (and I've seen all of them but two). It's witty and intelligent and apparently Allen himself thinks so since he borrowed so much from it when he made Whatever Works (2009). It's also the perfect companion piece to Annie Hall (1977). Allen's character Dobel in Anything Else is so clearly Alvy Singer from Annie Hall, only 25 years later. I love it. Now, where to begin? As mentioned before, there's a film festival in New York celebrating Brit Noirs, and British cinema has since my early teens been very dear to me. It all started when TV3 in Sweden was screening British postwar classics every afternoon. I suppose they must've got a good deal with some distributor, or possible they had to buy these films in order to get newer, juicier films. But for whatever reason, there they were, and I watched most of them. Both acknowledged classics such as Brief Encounter (1945) and much lesser known films such as The Red Tent (1956). And probably since then I've considered this particular era, the British postwar cinema (actually, it began already during the war) as one of the true golden ages of cinema. Not just British cinema but world cinema. It's so happens that there was something like a perfect storm for filmmaking. There was a lot of cash at hand, both from the government and from wealthy producers such as J. Arthur Rank, and there were a lot of exceptionally creative, inventive and forceful personalities, writer, directors and cinematographers, who were given at lot of freedom to do whatever they wanted to do. Public attendance was also very high. There were of course David Lean, Carol Reed and Michael Powell and Emeric Pressburger, and there were the brilliant Alexander Mackendrick, the cynical Robert Hamer. There were also directors such as Alberto Cavalcanti, Thorold Dickinson, and Charles Crichton. The brothers Boulding and the writer/director team Frank Lauder/Sidney Gilliat. And they were all in it together, with Lean editing films directed by Powell for example, or Crichton directing scripts written by Mackendrick. And there were also the extraordinary writer T.E.B. Clarke, as well as Angus MacPhail and John Dighton, and cinematographers such as Jack Cardiff, Christopher Callis, Robert Krasker and Douglas Slocombe. And the many wonderful actors at that. None more so the Celia Johnson, whose performance in Brief Encounter may be the most heartbreaking I've ever seen. They were all different of course, with various themes, styles and temperaments, from the extravagant dreamlike passion of Powell/Pressburger to the quiet realism of Lauder/Gilliat. Much more varied than conventional wisdom would have it. All in all, those years, say between 1940 and 1955, were awe-inspiring, still not really appreciated as much as they should. Things started to unravel after 1948, with less money, more competition from America and the internationalisation of both films and filmmakers. And then came the kitchen sink realism, which took much joy out of British cinema. Although The Loneliness of the Long Distance Runner (1962) is very good. Dead of Night (1945) Robert Hamer, Charles Crichton, Cavalcanti, Basil Dearden. Well, that should keep you occupied for quite some time. A few other directors are also worth mentioning. One is Val Guest, who made his first film in 1943, but I know very little of his big and varied output. But I do know that he made the weird science fiction/horror film The Quatermass Xperiment (1955), the musical Expresso Bongo (1959) and the very good crime thriller Hell Is a City (1960), which is rather like Ealing studios meets the existentialism of Michelangelo Antonioni. Two other directors, J. Lee Thompson and Seth Holt, are also worthy of consideration, but they didn't start to direct until the 1950s, and are therefore not part of this timeframe. But I might return to them later on. Howard Hawks is my favourite filmmaker, above and beyond anyone else. It is partly something I can discuss and explain, but there is an extra level of personal connection which I can neither discuss nor explain. Today I want to show a scene from Only Angels Have Wings (1939). It is probably my favourite scene from any of Hawks's films. And it is also the quintessential Hawks scene, visually as well as thematically. The focus on music for teambuilding. The woman showing the man that she is his equal. The easy interaction among all involved. Grant saying "You better be good." to Jean Arthur, and later asking for a match. And it is so warm and tender, with the underlining tragedy not visible if you do not know the story, but so very palpable if you do know it. These are things (as is the low hanging lamp in the foreground) which are repeated again and again in the films of Hawks. And it is all there, these two minutes being perhaps the most complete auteur statement in cinema history. The late Pope John Paul II (who as Pope's go was rather progressive) was also into films, and The Vatican produced a list of 45 favourite films in 1995, to celebrate cinema's 100th birthday. I know I'm a bit late writing about it, but it wasn't until last week I finally took the time to go through the list. And the fact of the matter is that as film lists go, it's pretty good. It's not some kind of Catholic kitsch, but really good films, religious or non religious. And it's broadminded enough to include films by Fellini, Pasolini, Bergman and Buñuel. But, what I'm most happy about is the fact that it also includes The Lavender Hill Mob (1951), the wonderful Ealing comedy with Alec Guinness. It's got one of the best scripts ever written, by T.E.B. Clarke, and the fact that it's on the list is an even more depressing sign of how much I miss the previous Pope. Yes, it's not hyperbole, the script is to clever, witty and rich and nuances and humour, it really is one of the best ever written. The man who was the 1980s is dead. John Hughes, the producer, writer and director of Sixteen Candles (1984), The Breakfast Club (1985) and Ferris Bueller's Day Off (1986) as well as the writer and producer of Pretty in Pink (1986) and Some Kind of Wonderful (1987). These films are smart, sweet, funny and sometimes rather brilliant. None more so than Ferris Bueller's Day Off, to these eyes one of the best films of the 1980s, even if it doesn't star Hughes star actress, Molly Ringwald. Unfortunately Hughes vanished in the 90s, only sometimes writing scripts of inferior quality. That's a pity but maybe it's just as well that he didn't direct anymore because if he had continued he wouldn't be so definitively of the 80s. It's too much to call him his generation's Preston Sturges, but there are similarites. R.I.P. Howard Deutch directed Pretty in Pink and Some Kind of Wonderful. After that he's made episodes of tv-shows and various sequels. I think it's safe to say that Hughes was the creative force behind those two films. Have been in Paris for a couple of days. 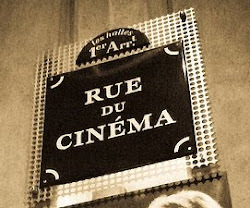 One of the many reasons I like Paris more than any other city in the world is the overwhelming abundance of cinemas, films, retrospectives and festivals that are on offer, every single day. During my five days this time I had to choose between a Woody Allen retrospective, two Michael Mann retros, one Douglas Sirk retro, another one on Robert Ryan. There was one celebrating Vittorio de Sica, and another for young Russian cinema. And so on and so forth. It's easy to get out of control. They also have many films released on DVD which you will not find anywhere else, such as early Richard Fleischer films. Among them Child of Divorce (1946), Follow Me Lightly (1949, written by Anthony Mann who also co-directed) and Armored Car Robbery (1950). I've long had a soft spot for Fleischer and I will enjoy watching them. His The Narrow Margin (1952) is a brilliant little film and The Boston Strangler (1968) is extraordinary as well. Anyway. More on Fleischer to come. Another thing about Paris is that it makes me feel closer to Truffaut. And, as usual, I went to visit his grave. When I wrote about Le Trou the other week I said it made me want to watch Casque d'or (1952) again. Well, now I have. It was so much much better than I remembered it. It must rate as one of the best films I've ever seen. It's done so lightly and tenderly, with a poetic grace, and yet the story is so cruel and tragic. Both the writing and directing of Becker is outstanding, as are many of the performances. Magic!